McConnell School of Dance Performance Division was established in 2007. The Performance Division performs as “McConnell Irish Dancers” and " Dawnswyr Gwerin Yr Afon Goch" (Red River Welsh Folk Dancers). The troupe is a professional group comprised of dancers, musicians, and singers. The McConnell Irish Dancers perform locally at over 60 shows each year and have danced all over the world. Performance Division dancers are dedicated, hardworking, and willing to commit to dance above all other extracurricular activities. Dancers must achieve a high standard of Irish dance, exhibit strong performance skills & work as well as a team, in order to perform with the McConnell Irish Dancers. The 2018 - 2019 Performance Division is comprised of 4 Teams. Division assigned placement based on dancer’s age, skill level and performance abilities. Not all applicants will gain admission to Performance Division and the school reserves the right to determine placement and enrolment. The Performance Division season is 12 months and dancers are required to commit to shows for the entire duration of the year (Sept 1 - to commencement of lessons in Sept the following year) Lessons are held from September to July (11 months) and students must register for the entire season. 1. Who have completed at least 1 full year in our general or competitive programs. 2. Who are enrolled in at least 1 competitive division class. Performance Division dancers are required to take at least 1 competitive class (at their current level) in order to learn dances used in Performance choreography. 3. Dancers need to be proficient in all four Level 1 dances before auditioning. Enrolment in Performance Division does not guarantee a dancer will perform with McConnell Irish Dance troupe. New members or younger dancers should not expect to perform at every show. Participation in shows is dependant on many factors which include requirements from the client, dancers contributions to the show, and seniority. In some cases, dancers will be asked to take private / semi private lessons if they are not able to maintain the standard within their team and level. Interview - All Performance Division applicants (Junior, Performance, and Senior) must attend an interview session. Performance Division classes are held on Tuesday evenings from September until the end of July. Placement on Performance Division Teams is determined by the instructors and dancers must meet the standard for each team. Performance Teams 1 & 2 are for young dancers who are dedicated, hard working, and interested in high level performance-style Irish dance. 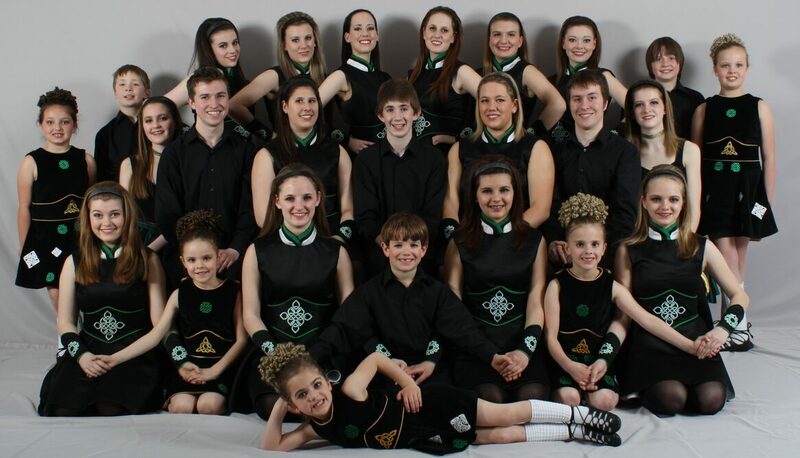 Performance Teams 3 & 4 are for dedicated Irish dancers, 12 & older, who are levels 3 - 5. The standard for Team 4 is extremely high and dancers must be of advanced level ( 4- 5) for this team. Performance Division dancers will be assessed through an audition process which includes basic technique, steps, choreography, and stage presence. Auditions will be held the 1st class and dancers will be placed in their team at that time. Dancers will be informed of the soft shoe / hard shoe technique and choreography classes they will need to attend at the audition. In some cases, dancers will attend multiple technique classes to be determined by their individual needs. Dancers technique classes may change during the season, depending on their skills and progress throughout the year. Dancers should not miss any classes two weeks prior to major performances (Christmas Show, Brandon Winter Fest’, St Patricks’ Fest’, St. Patrick’s Week Performances, Recital, and Folklorama) ​Please note, in the past we have been lenient of dancer's attendance for lessons 2 weeks prior to our major performances but this has caused a great deal of additional work and strain for the group. For 2018 - 2019, we will insist dancers follow the mandatory lesson dates without exception. Students registering for the Performance Division must be available for the majority of shows during the dance season. Mandatory Performances - ​Please note, in the past we have been lenient of dancer's attendance for major performances but this has caused a great deal of additional work and strain for the group. For 2018 - 2019, we will insist dancers follow the mandatory show dates without exception. Dancers must maintain a show attendance of no less than 80 % for performances required for their current level, based on hours allocated to each show. Not all Performance Division Levels will be required for every performance. Details for each show will be posted on Teamsnap. Dancers should confirm participation on Teamsnap least 1 week prior to the Tuesday practice before the show. Week day performances during school or work hours are never considered mandatory. Performances with less than 1 week notice will not be considered mandatory. For dancers attending these optional performances, additional attendance hours will be earned. All Performance Division members are expected to show a positive attitude at all times and work together as a team. Equal value is placed on dancer’s positive attitudes as well as their skill as a performer in the Division. Hard work and dedication is required in class and with at home practice. Dancers must demonstrate a willingness to learn new things and a desire to improve as a dancer and performer. Competitive or mean-spirited behaviour will not be tolerated from dancers or their family members. Disrespectful behaviour towards Instructors, and Performance Division executive members from dancers or their family members will result in suspension or expulsion from the Performance Division. Participation in the Performance Division requires a great amount of commitment from dancers, but also requires a large commitment on the part of dancer’s family members. There are many additional expenses with additional lessons, costuming, dance supplies, and travel to and from performances. Parents must be able to arrange their child’s transport to lessons and performances. Often this includes long waits in lobbies, parking lots and delays due to performances which may run behind schedule. We strongly encourage parents to car-pool to lessons and performances in order to save on time and fuel. Family members are also expected to work cooperatively with McConnell School of Dance and follow all policies of Performance Division. Difficulties with parents or family members may result in dancers’ removal from the Division. New Class Costumes for 2018 - 2019. Orders will be placed at the end of September and costumes will arrive by December 2018. Performance Dancers require a well-fitting class costume for the season. Dancers who’ve out-grown their dress, should order a costume immediately upon entering a new season or whenever necessary. Female Dancers - Solo costumes are elaborate and unique dance dresses. Solo dresses range in price from $300 - $3000. There is a large market for 2nd hand solo dresses on the internet and many website dedicated to listing used Irish solo costumes. Male Dancers - Embroidered vets, cummerbunds, belts with Celtic designed buckles. Most professional dress makers also offer solo items for male dancers and prices vary by design. Performance dancers earn the privilege to wear a Solo costume through hard work and accomplishments. We will advise parents when dancers have earned their solo costume. All solo costumes will need to be approved by the school, including new and second hand costumes. New Solo Dresses style, colour, and fabric will need to be approved by the school prior to beginning work with a seamstress. Drawings, designs, and colour swatches are necessary in order to access whether or not a solo dress design will complement the dancer and work will with other dancers in the group. Additional costumes may also be needed for Performance Dancers who have roles in our major productions. MSDSA & Performance Division assists in funding some costumes for our major productions. Dancers who participate in dance productions may be required to purchase additional costumes for the show. Dancers & parents will be notified during the season, if additional costumes are required. Lesson Attire - All dancers should have dance trainers (not runners) with them for every class. Black Trainers are required for ALL Performance Division Dancers and MUST be worn to and from Performances. Black sneakers may be used as substitute for younger dancers who cannot fit standard trainers, but the inhibit dancers and can be restrictive for Irish dance. All Performance Division dancers under 18 will need to maintain their academic standard and parents are asked to advise us immediately should there be concerns with school marks. Dancers whose grades fall behind will be placed may be placed on leave of absence from the Performance Division until their marks improve. Dancers are not required to bring their report cards, however if parents feel this is helpful we will certainly assist in checking report cards regularly. 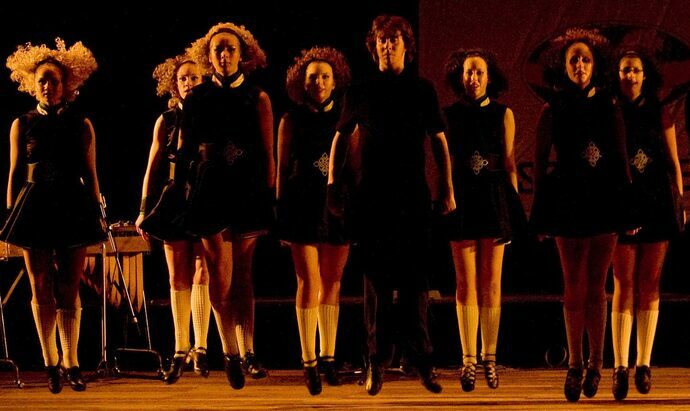 Irish dance is a highly demanding physical activity. Minor injuries (stiffness, aching muscles, minor bruising, and blisters) can be common for some. Dancers who have long lasting issues or isolated pain as a result of Irish dance will be asked to seek treatment from a physician immediately. Dancers who are injured are expected to attend class so they do not fall behind with their routines. Instructors reserve the right to limit dancer’s activities in class due to their injury or as part of the recovery process. Parents are asked to fully support us in these decisions as our aim is always for the best interests of our dancers safety and health. Depending on the type of injury and the severity, some dancers may experience delays or setbacks with the progress in Irish dance. This is normal and should be expected from dancers recovering from an injury. Instructors and assistants will work with the student as best they can in class, however in some cases dancers may be asked to take private lessons or switch levels. Instructors are not available for discussions with dancers or parents before or during the lesson. Issues arising at class or after performances should be dealt with at the end of every class. Please limit texts to urgent matters and during studio business hours only. Unless an absolute emergency, please do not disturb instructors during class time. Please do not send Facebook messages. For serious issues, please contact us by phone or email to schedule a meeting. All communication, newsletters, and school notices, are sent through email. Please provide a current email address on your registration form to receive school information throughout the dance year and update your information in the Student Portal should you have a change in contact information. Dancers are required to fullfill all obligations for their current Performance Division level. Students with regular status will receive full benefits from Performance Division. Short term break due to illness or injury. Exclusion from individual dances, performances, and travel. Dancers who fail to comply with the terms and conditions of the Performance Division may receive a 1 year suspension from the Performance Division. After 1 year, students will be re-evaluated without prejudice. 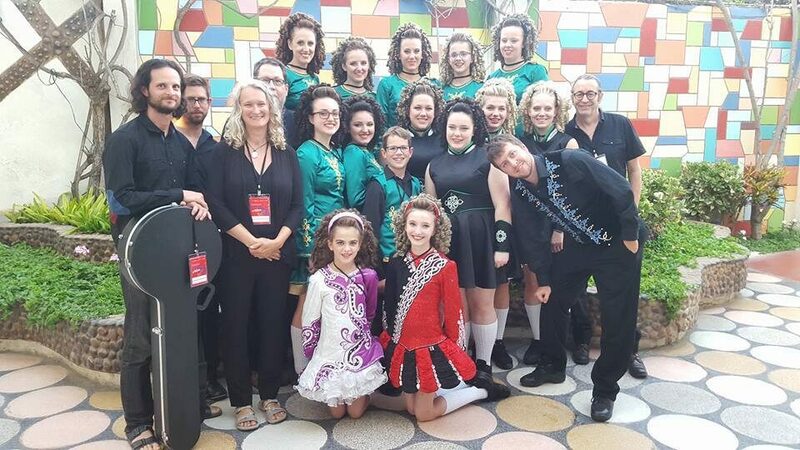 McConnell Irish Dancer’s Performance Division dancers perform at, St. Patrick's Fest', Recital, and Folklorama, in addition to over 60 shows throughout the season. Decisions regarding which dances a student performs are left to the discretion of the instructors and the school as it is our responsibility to consider the entire group and maintain a professional quality performance. 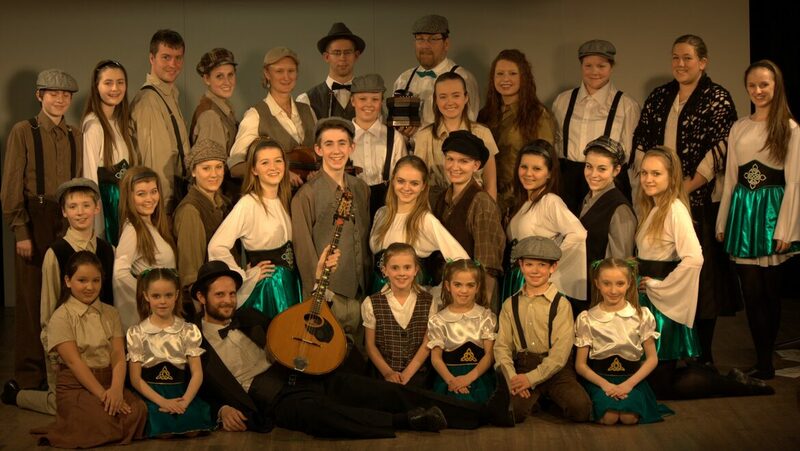 Our performances include both traditional and modern style Irish dances. Traditional Ceili dances and choreographed routines for our classes have a set number of dancers required for each dance. There are times when dancers must share a position. Due to our commitment to sponsoring the United Kingdom Pavilion, some of our shows will include Irish, Welsh, English, and Scottish dance. All Performance Division members are expected to participate in every aspect, not just Irish dance performances. All performances are listed on Teamsnap. Updates are sent via email so please check your email or Teamsnap app before leaving for each show as details can change at the last minute. Please try to arrive on time for shows and allow for traffic or parking delays. If you are running late, please do not speed and risk accident. All dancers will need to be checked in and out of dressing room for our major performances St. Patrick’s, Recital, and Folklorama. Dancers under 12 will require an authorised parent or guardian to check out. Healthy, non-messy snacks and drinks (clear liquids) are recommended for all dancers in the dressing room at performances as dancer’s burn a great deal of energy. Please send peanut free snacks as we have dancers with allergies. It is customary and considered good form for dancers or groups who perform at the same show to politely watch each other’s performance (if possible) and offer congratulations on successful show. Please make every effort to foster good relations with other dancers and groups at shows. Please do not discuss or grade other dancers or groups in public and refrain from making derogatory remarks about other performers. Please remember that while wearing your McConnell Irish Dancer’s attire, or costume, you are representing the entire school and appropriate and polite behaviour is expected at all times. Dancers & accompanying family members are expected to uphold the good reputation McConnell Irish Dancers have established through years of hard work in building relations with our many out of town booking clients. Any violation of the policies below from dancers or their family members will result in dancers being sent home (at their own expense) and could result in expulsion from Performance Division. Good & respectful behaviour is expected at all times. No running or loud voices in hotel lobby, pool area, or hallways. Please follow all hotel policies, respect all pool rules and closing times. Keep hotel rooms clean, be respectful to hotel staff, and do not leave a mess behind you. Absolutely no disagreements between dancers, dancing siblings/ family, parents, and non-dancing siblings will be permitted. Dancers are expected to get along, include all members of their age group in any group activities or outings. Dancers are expected to eat healthy meals, drink lots of water, and avoid foods which could make them sick and unable to perform. Parents, please send dancers with healthy snacks and the recommended $30 / day food allowance. Dancers are expected to keep early bedtimes and get plenty of rest for performances. Pool time should be limited for dancers performing as it tires dancers out and they are unable to perform their best. Parents, please make certain young dancers do not overdo it in the pool. Dancers are encouraged to wear their McConnell attire as much as possible. Modest attire is expected and dancers with short or revealing clothing will be asked to change in to something more appropriate. Absolutely no consumption of alcohol or any illegal substance from dancers under 18 years of age. Absolutely no unauthorised guests in dancer’s rooms at any time. Room & travel allocations are determined by the school, not dancers or parents. Chaperones are determined by the school and dancers are expected to treat chaperones with respect at all times. Dancers who do not follow the rules for Performance Division and guidelines for out of town travel may risk being sent home at their own expense. Performance Division fundraising efforts, along with revenue from performances goes towards necessary purchases of equipment for shows, sets & props, costumes, and travel related expenses for dancers, musicians, and technical staff. Performance Division members are required to participate in group fundraisers and may be required to provide volunteer hours for school events and activities. Performance Division fundraising is organised on a yearly basis and additional fundraisers may be announced during the season. 3 hour volunteering from family members or friends during the event. Please note, dancers cannot volunteer for this as they will be required to perform. 6 hours per day volunteering from family member or friend during the event. Please note, dancers cannot volunteer for this as they will be required to perform. Accommodations and food are generally provided by the host country at the festivals we attend. Dancers will receive funding from MSDSA to cover the costs of some of their travel expenses. Subsidy will vary from year to year. Most C.I.O.F.F festivals are geared for performers 14 and over, therefore C.I.O.F.F festivals are not usually appropriate for younger dancers however there are a growing number of festivals geared for younger participants. Festivals have limits to the number of performers and most have requirements for live music. Dancers are selected based on their abilities, their contributions to the show, their level of maturity and their abilities to manage themselves travelling away from home. Some dancers may be offered the option of paying for their own travel costs, food, and lodging, if festivals limit the amount of performers with complimentary services. 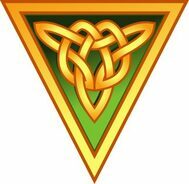 In July 2012, 43 members of Performance Division attended the American Celtic Irish Dance Festival at Disney World, Florida. The festival included a performance in Downtown Disney, a parade in the Magic Kingdom, and a Disney performer workshop. In August 2013, 73 members of Performance Division (including dancers, musicians and singers attended the Tailteann Nua Festival in, Limerick Ireland. Many of our dancers also attended & performed at the World Irish Dance Day in Dublin , Ireland. In July 2017, our Performance Division participated in the CIOFF festival in Folkmoot, North Carolina. For performances more than 25 km outside city limits dancers or drivers may receive fuel reimbursement, if the show budget allows. If the performance requires an over-night stay, dancers may be provided accommodations (hotel or billeting). In cases where there are budget constraints, dancers will be offered the option to attend the performance at their own expense. Not all Performance Division dancers will be automatically invited to out of town performances. Dancers are selected based on their abilities, their contributions to the show, their level of maturity and their abilities to manage themselves travelling away from home. Performance Division dancers invited to participate in an International trip may receive funding from MSDSA & Performance Division MSDSA’s policy is to provide a minimum 60% of their proceeds each year for International travel. In many years subsidy is higher than 60 %. Dancers who participate in International trips are encouraged to begin preparing early in the season. Class & show attendance, volunteer hours, and participation in fundraisers are factors which affect the level of subsidy received. Additional individual or group fundraising may be organised for international trips.